Because I had missed most of my junior year in high school, I had to go to a different school so I could still graduate on time. The guidance counselor there helped me figure out a way to make it work. I was a year ahead in math so I didn’t have to take math (Calculus was not a requirement). I did have to take Chemistry over again. I had to take two English classes and two social studies classes (11th and 12th grade). I felt different than everyone else. I had friends in both classes. I didn’t fit because this was my first year there and mostly everyone had been there for four years together. There was some shame in that I had to go to that school because I was depressed. I didn’t explain it to anyone that I remember, but I am sure that they knew. Two of my cousins went there. I felt like they tried to avoid me when I saw them. That was painful. Once in awhile, one of them would say hi when he passed me in the hallway. However, this was usually when no one else was around. I did have about 8 friends, but more of them were in 11th than in 12th. When it was time to go on one of the senior trips, I didn’t really no anyone. I felt so alone and was embarrassed that I was there without friends. I was a person who had been in the psychiatric hospital and I am sure most of them knew it. When it came to the big senior trip, I didn’t go. The strong support of my family got me through it all. I did graduate on time and with a Regent’s diploma. In NY state is harder to get than a regular diploma. I had been working during my junior year. I worked a lot during that summer. Then, it was off to college. I was depressed most of the time. This meant that I could not concentrate and therefore could not read and comprehend the books. I went to every single class, but that was not enough. I ended up with a D in one of my classes and an F in another. The next semester went a lot better. 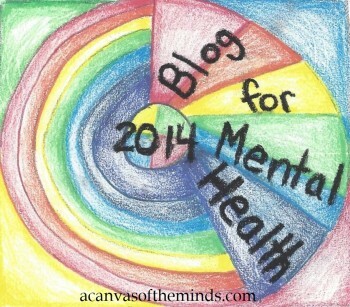 However, there were many times that I was depressed and isolated. I would not go to the cafeteria because I didn’t want anyone to see me alone. I did have friends while at college and a few of them I have kept in touch with. After going to two years at that school, I transferred to another school. I now found myself having to buy a car. This required me having to get a job. I was able to get an associate’s degree after one semester as most of my credits transferred. It was at that job, that I met my first boyfriend. We were together for months. He knew I had bipolar disorder. He was pretty accepting of it. However, he said that it would prevent him from ever marrying me. So, I ended up leaving that relationship. 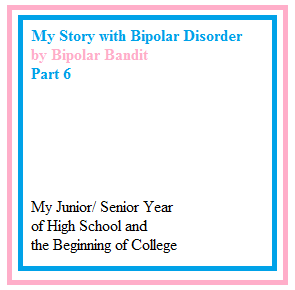 This entry was posted in Uncategorized and tagged bipolar disorder, bipolar disorder in school, depression, depression while in college, isolation, mania, mental illness in high school. Bookmark the permalink.